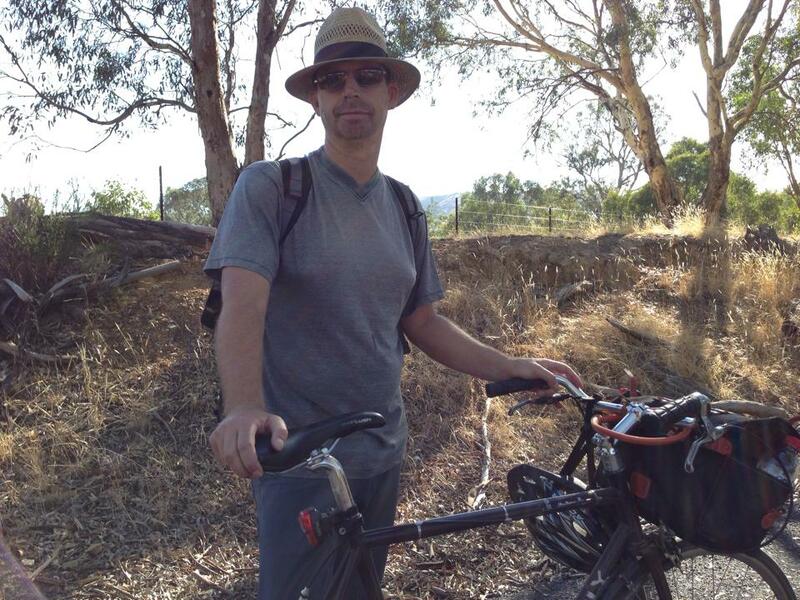 What is 30 Days of Biking? Very simply, it’s a pledge to ride your bike every day in April, however far you want, no matter the weather! 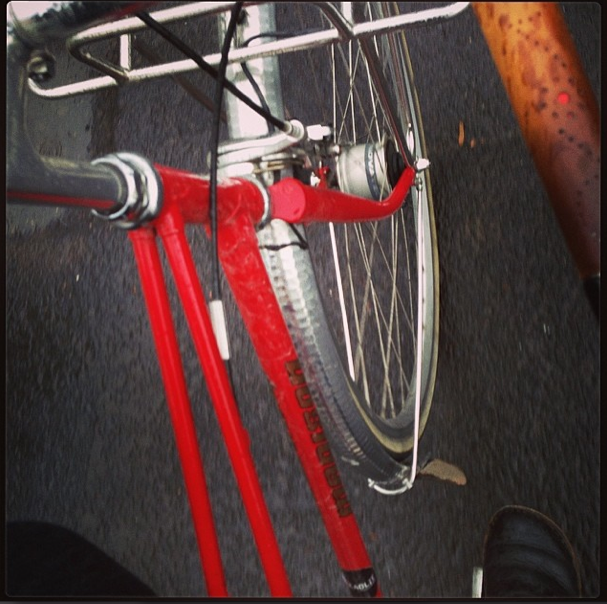 Next, you share your adventures online, with #30daysofbiking. That’s all there is to it. Generally, we’d be riding every day anyway. But’s not like we’re doing anything special. And there is the conundrum. 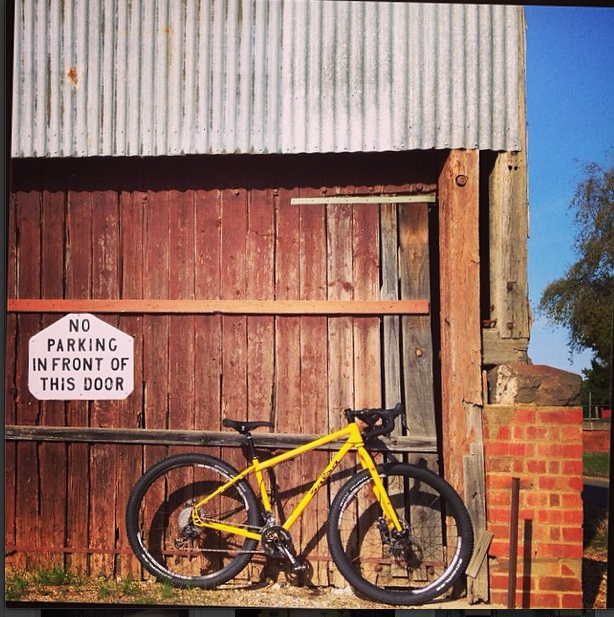 Our rides aren’t particularly interesting, its about getting to school, the shops, work or a friends. And its just because they are such an everyday part of life that most of the time I forget to photograph/hashtag/tweet anything about them. Let alone anything interesting. Happily, April kicked off while I was actually engaged in a some pretty cool riding. 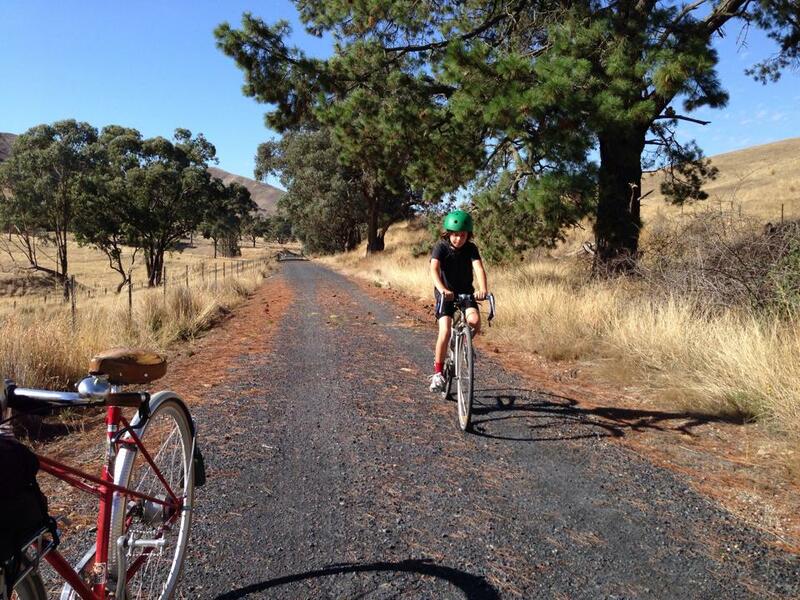 A whole week of it on three different rail trails in Victoria with Rail Trail Bike Tours. Additionally I was on a different bike to my usual ones, a Salsa Fargo which, once I had the hang of those double-tap gears, was also fun. 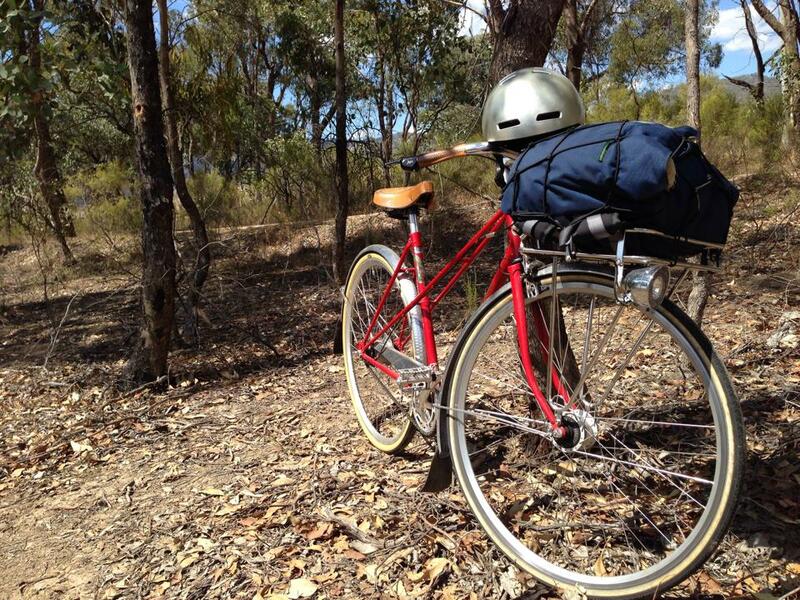 For the first five days of #30daysofbiking I was busy riding from Beechworth to Mansfield and down to Tallarook. 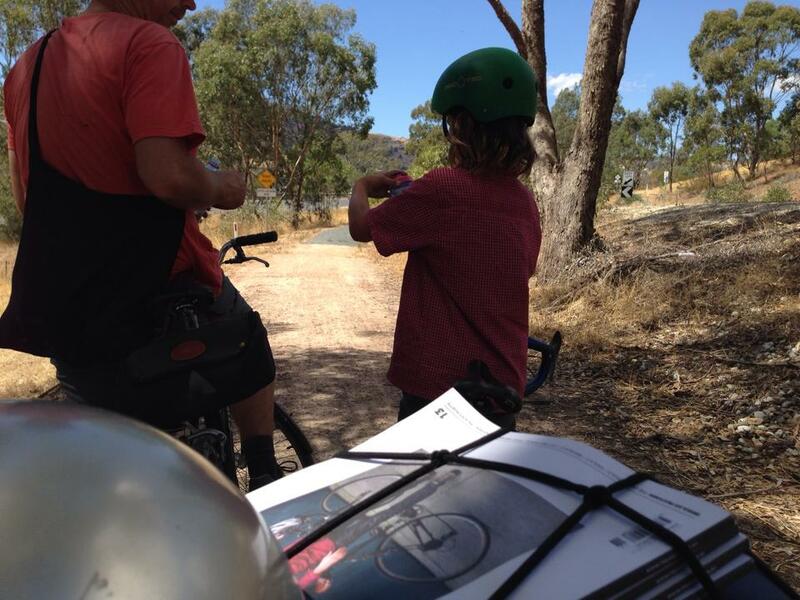 Once back in Melbourne it was school holidays and I had been hoping for some nice days on the bike with the Flipster. Unfortunately it rained for the next five days and while this was great for the garden and our water tanks, it did have the effect of reducing our daily rides to just those required to get around. Nothing to see here! But now the fine weather is back there is more chance we’ll manage to extend our rides beyond the immediate. And maybe find something interesting to say about them! 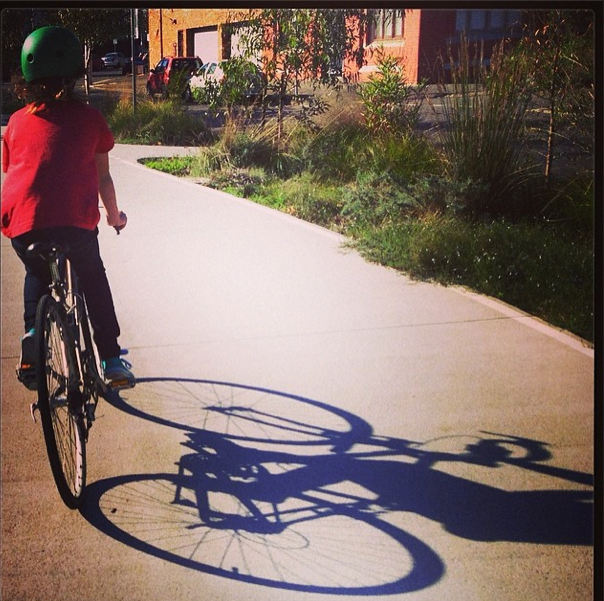 Here is the Flipster casting some fine shadows on the way to 3CR Community Radio station on Monday. Happily there are still 15 days to go for #30daysofbiking and at least some of those are during the school holidays and a weekend away we have planned on the bikes so here’s to inspiration! If you do want to see what our boring days on the bike look like then you’ll possibly find a few posts @vaguelyspecific on Instagram or Twitter But if you really want to be inspired then check out the #30daysofbiking hashtag on Twitter, Instagram or Vine, or check this out. Tallarook was the starting point for our very first ever three day ride with The Flipster. It’s only one hour from Melbourne, or slightly less, whether that’s by train or car, and as the starting point for the Great Victorian Rail Trail there was nothing crook about it at all. 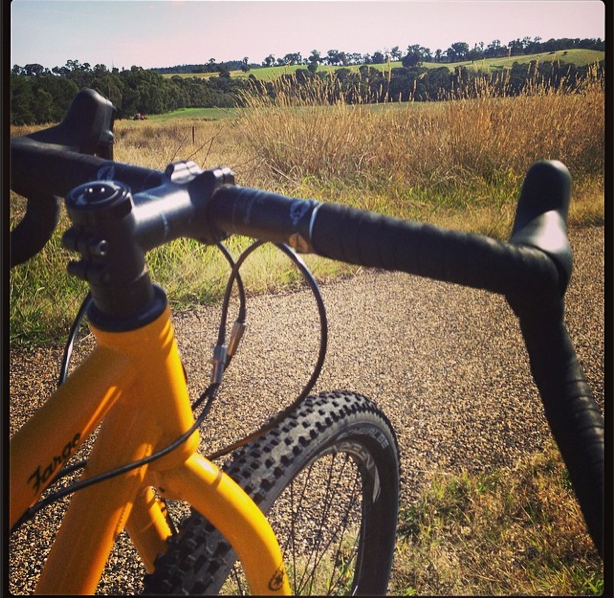 The Great Victorian Rail Trail is 120-ish kms of connected off road riding running from Tallarook to Mansfield via Yea and Yarck. 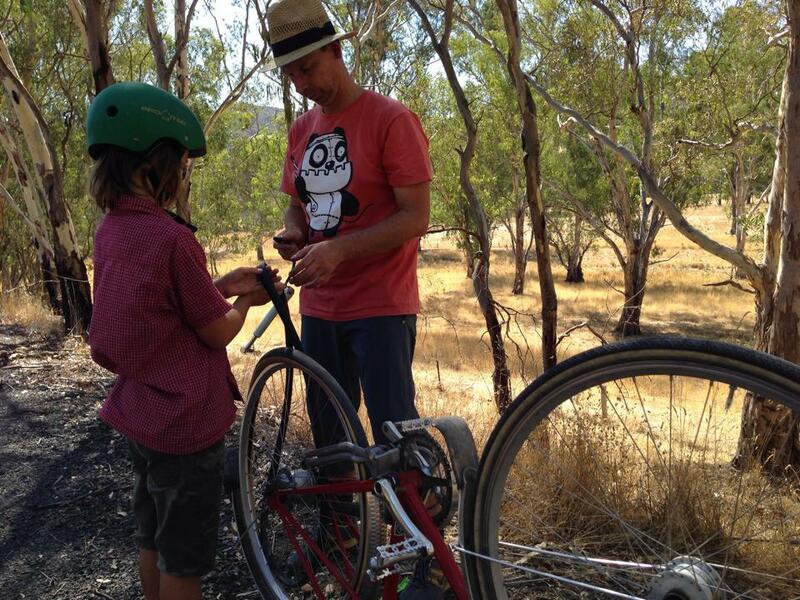 With towns spaced at quite small distances along it, often twenty or thirty kms (sometimes less) it makes a great trail to try with kids, or even just to ride yourself when you really can’t be fussed doing much planning or carrying. But for now, lets focus on the sunshine, the devonshire teas, the cold beers, the flat tyres, the best spaghetti, the coffee, glorious days outdoors and the simplicity of getting up everyday and only having to ride. 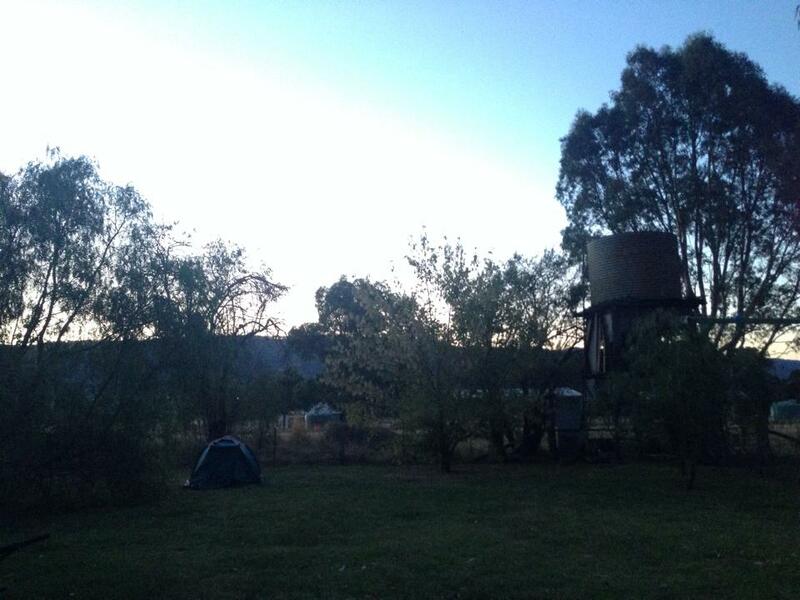 Briefly, we rode from Tallarook to Yea, Yea to Yarck and then Yarck to Bonnie Doon over three days. We abandoned the last stage to Mansfield as we discovered the Flipster’s limitations over the first few days. We discovered the Flipster can average 30-35kms per day and still enjoy the ride, that, with stops, you need to plan for an average of 10kms per hour, and that it helps if you get up early and ride your daily thirty-ish kms before midday and the 30+ temperatures. We also discovered that it is possible to ride excruciatingly slow up a large hill, the Merton Gap, with a whingy ten year old and have all forgotten about it by the time you spin down the other side. We didn’t want to be bothered carrying stuff so took one change of clothes each carried in one bag that the Dutchman and I took turns in carrying. We ate all of our meals at pubs, cafes and general stores. Because of the relatively small distances between towns this was easy and meant we didn’t have to worry about carrying food etc. It was our version of credit card touring. We rode our city bikes; a single-speed Surly Steamroller, an eight speed custom built commuter and the Flipster’s first road bike. All had their usual city tyres. 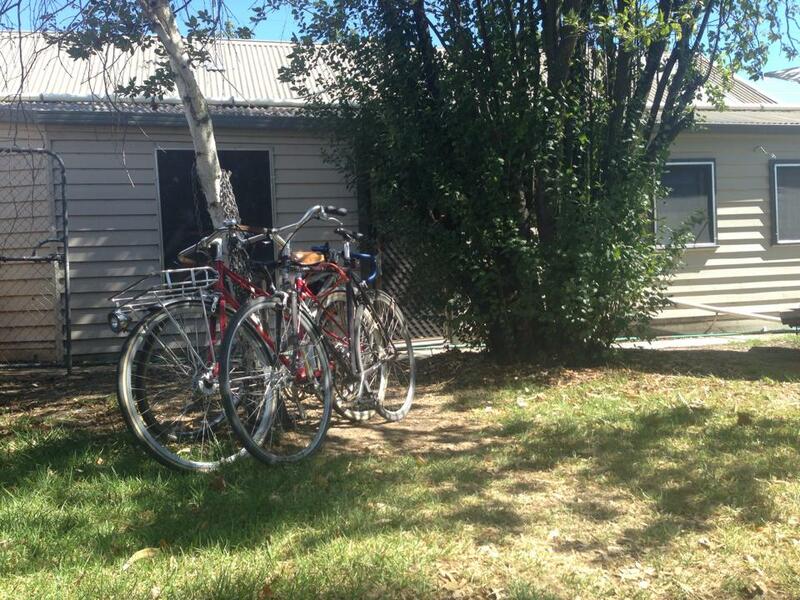 We stayed at the Yea Motel and the Yarck Pub, having made reservations beforehand, since it was a long weekend. Both were pretty basic, well actually the pub was extremely basic, but fine for one night and had excellent food! 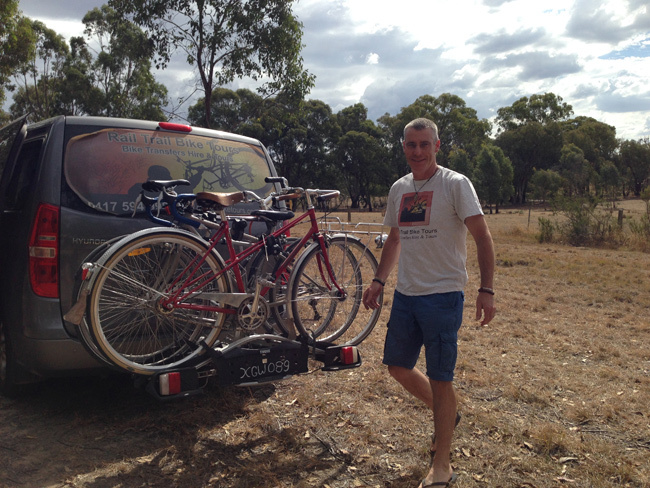 And at the end of our ride we called Mark Spencer of Rail Trail Bike Tours to come and pick us up and take us and our bikes back to our car at Tallarook. But not before having a beer. If you’d like to hear what the Flipster thought about it check out this podcast. 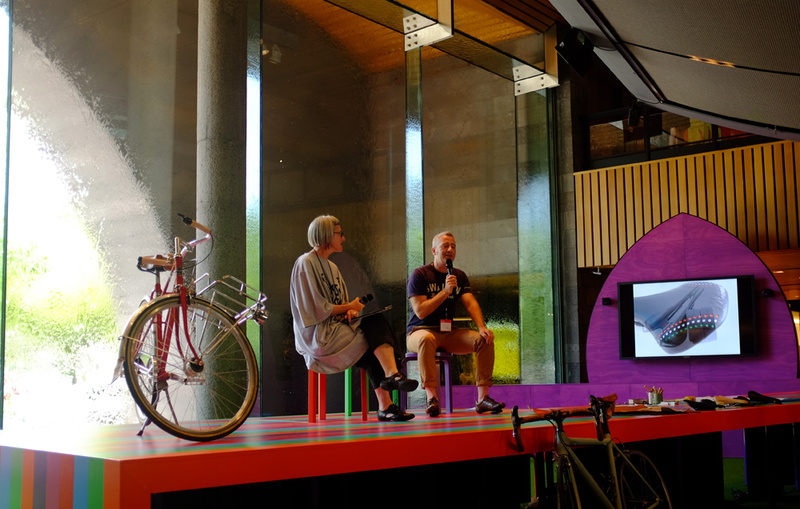 I dropped into Melbourne Now last week to hear Mick Peel of Busyman Bicycles talking about his fine crafty ways with leather. Mick is responsible for the recovered saddle on my bike, along with the grips and matching mud flaps. Watching the parade of creative work on his blog is always inspiring so I was looking forward to hearing him speak about what he does. We’ve had him as a guest on the Yarra BUG Radio Show in the past and I’ve featured his work in Treadlie Magazine. Mick iss a great speaker and I’ve always enjoyed whenever I’ve had the opportunity to listen to him in the past. Mick asked me to bring in my Madison mixte, he was bringing in several saddles and handlebars he’d worked on along with his own bike but thought it might be nice to have a second bike on display. As an added bonus, besides getting lots of attention lavished on my favourite bicycle, Mick also took the opportunity to replace my leather grips which were starting to look a little ratty. It gave him something to work on and chat about with visitors to the workshop, and gave me spanking new grips! And here she is up on stage with Mick and Deborah Ratliff, Melbourne Now curator at the NGV. You’ll have to excuse the photos, they’re awful, even for quick snaps on the phone. 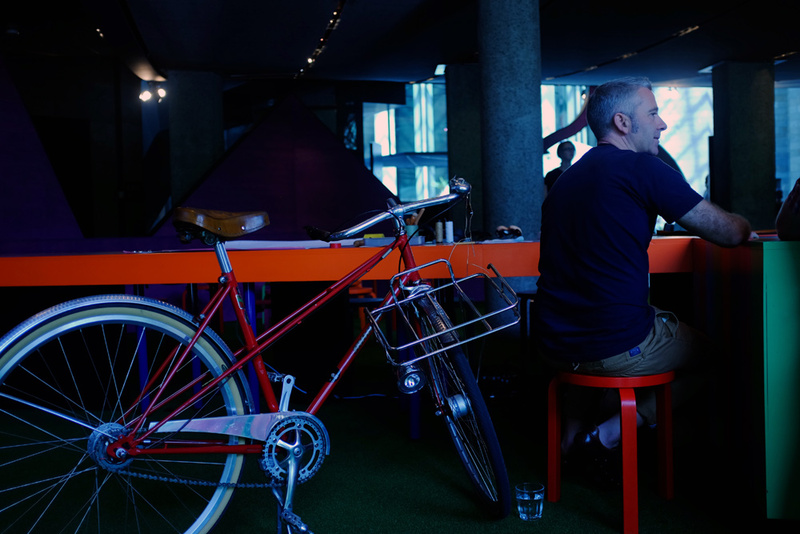 But fitting I thought, proof positive that the bicycle Commuter Cycles built for me, really is a work of art!